During late 1944, RAF Bomber Command was sending huge formations of Lancaster bombers over Germany night after night. During this massive offensive the Lancaster crews were attacked relentlessly by Luftwaffe ME-110 Night Fighters. 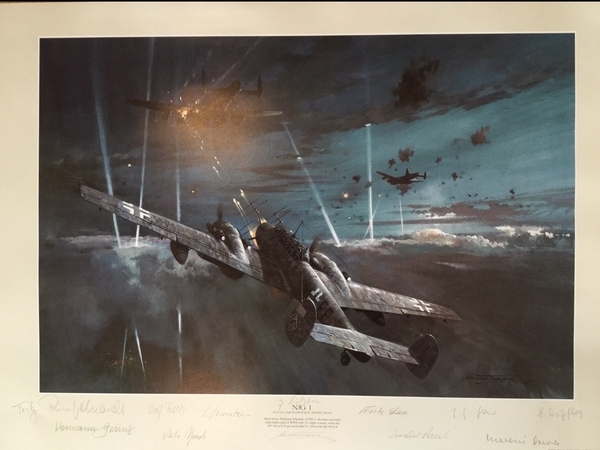 Major Heinz-Wolfgang Schnaufer, with 121 aerial victories, was the most successful night fighter pilot of WWII, and scored his 100th kill at 8:55 PM on the 9th of October 1944 over the Ruhr Valley, the event depicted here. Signed by 10 NJG-1 Aircrew, all Knight's Cross Recipients.